The ARDS test (Association of Racing Driver Schools) is the test required in order to get the National 'B' racing license from the MSA (Motor Sport Association). Once passed, you can enter race events and attend Test Days at race tracks. Test days differ from Track Days in that there are no novices - every person there has a race license, and the strict track day rules are removed. For example, overtaking is unrestricted. I arrived at Brands Hatch for sign-on at 5:45. An evening track day was going on, with some pretty fast cars blatting around. Just myself and one other guy were doing the license, and the instructor talked us through the process. We were to do the practical test first in order to make best use of the daylight. He said that the aim of the driving test is to show competency and not speed. They are looking for a good understanding of racing lines, turn-in points, apex. Also looking for mechanical sympathy, heel & toe technique, good mirror work, etc. The car in use is a Williams Megane, nothing special but quick enough. We were told not to take the car about 4500rpm, and just to use third & fourth gears. I was really nervous, feeling that i was driving within unusual parameters rather than just driving the way I drive and relaxing. Once out on the track, the instructor talked me around the track for a few laps before going quiet and doing the assessment. I think it was about 5 laps of assessment. My driving was awful, i missed turn-ins and apexes like there was no tomorrow, got the breaking wrong, used the wrong gears, and just generally drove like a fool. Thankfully, he gave me 85% which is an easy pass. We then did the written test, which was childsplay, and i got 100% in that. Just a case of sending off the paperwork and i'm done! * Throttle return springs. 2 of these required to stop the throttle sticking open. * Graphics & Bling. Well it can't be a plain black race car, can it ?!! * Rookie Sticker. The yellow background and black cross. Needed until i've done 10 races. * New fluids. I'm replacing all hydraulics with some high-temp stuff. The current fluid has been left in the open and expands when hot. I spent the day mostly messing about and putting stickers on. I also managed to get the throttle return spring fitted to the pedal, and fit the speed sensor. This is a bit less than reliable unfortunately, so i'll work on that tomorrow. I also got the new DVR video recorder fitted, but for some reason the sound was out of sync. No idea why that is, weird. I'll check the settings and try again tomorrow. Had a really good day today, i'm really getting through the car's to-do list and covering off some of the niggles that have been bothering me for ages. After much fettling, we got the speed sensor sorted. Getting the gap correct on the bolts was very difficult, and tuning the correct pulses per minute for the speed took ages too. Next, i wired in the immobiliser key-lock. This just cuts off the fuel pump, and its really as useful for me as it is as an anti-theft thing. Means i can cut off the fuel and leave the electronics running without killing the battery too quickly. At the same time, I also installed an on/off switch for the computer on the dash. We then replaced the clutch fluid with some 'racing' stuff from halfords. God knows whether its any good or not, but hopefully it will help with the clutch slipping problem when it gets hot. Presumably caused by the old fluid expanding. I then installed the transponder in the front of the car - that's going to be used to record laptimes when racing. I managed to feed this off the 'washer bottle' feed and connect that behind the dash. Finally, we took off the camera mount and Chris is going to have a go at sorting that out over the week. It unfortunately developed a case of the sags! I've now ordered some quick release fittings for the scuttle and dash so i can whip it on and off a bit quicker! May 10 2008 - Ready to Race? I reckon the car is ready to race. Still having fuelling issues, but they're fairly minor. Today, i installed quick releases on the scuttle for fast removal. Here are the first photos in its new colours! The day before the track day decided to try and solve the fuelling issues by destroying the cat. See pictures! SBD recommended that we did this, he said the problems sounded like an exhaust restriction. Anyway, track day went on. Car handled like a dream, controlled drift out of corners was delightful, even without the front ARB connected. Did i mention that it snapped AGAIN? However the car was running terribly, down on power, and midrange fuelling terrible. A marshall came over to me to say that in his experience it was a blocked exhaust and it sounded like it was wheezing! So I've come to the conclusion that my exhaust is partially blocked, not allowing sufficient flow. Steve at SBD first diagnosed this, then a marshall at Brands today. It breezed through its noise test (7db too quiet apparently!) and then just sounded like its being suffocated all the time. So... i'm getting ZERO exhausts to make me a new one at the weekend. Lets hope that fixes it!! Absolutely Awesome, I'm blown away! Its like a new car! Mid range and top end power are much improved, i accidentally kept hitting the rev limiter, it got there that much quicker without groaning from being suffocated. Kevin from Zero exhausts was great, really recommend him. He created me a new stainless straight through can, plus modification to the manifold for £150+vat. Looks lovely- see pics. In terms of noise, its louder and deeper at tickover (Nice!) and seems quieter at the top end. I'm very happy, sounds perfect. Happy Happy Happy :) Bring on Lydden on Sat. May 24 2008 - Lydden Practice... and a triumph!!! After 10 months of hard work on the car, we have finally achieved it. What a great day! The objective at the start was to have a car that was incredible, with no production vehicles able to touch it, and finally i feel its been pretty much gained. AMAZING the difference an exhaust can make! From last week's track day really struggling to overtake much, the car was destroying pretty much everything on track. 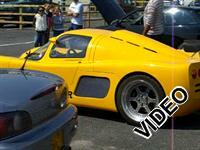 The only faster cars were a Caterham CSL 260, Another Megabusa, and a Radical. As i'm sure many westerfield owners have found in the past, it really is comical when owners of really expensive cars come over and wonder what the hell you're driving. I particularly enjoyed lapping the Ultima GTR (twice on one session). They almost started me in the novice group because I hadn't driven the track, but i persuaded them to put me in intermediate. By session number two, I was the fastest car on track so I upgraded to the Experienced group. This was great as I got to follow Steve in his red megabusa, and learn how he did it. I was able to keep up with him, but it required an incredible degree of concentration - one small mistake like locking up a wheel, or a botched off-line overtake, and a significant gap opened up between us. From finding racing a little intimidating, i now can't wait - they're a really friendly bunch, i LOVE the circuit, and i don't think i'm that far from the pace. Bruce in the faster Caterham CSL was lapping almost 3 seconds quicker than me (on slicks), and i'm lucky to have a copy of his datalogger files - i'll analyse those as soon as i'm in front of a PC and see what i can learn. I had a session out with the instructor who helped to tidy me up. My driving is not consistent enough at the moment, i need to really work on that. I had four little incidents: I spun on cold tyres once, on hot tyres once, went over the gravel once and kept on, and hit a tyre wall.... now that was scary - going straight on through the gravel thinking "no no no no no" and eventually just kissed it - just enough to break the cycle wing but cause no further damage. The race is on Saturday, my objective is to get signatures on my license (i.e. Finish the race! ), so i will not be pushing at all..... that's the plan anyway, but can i be disciplined enough? I do have this worrying habit of spinning! 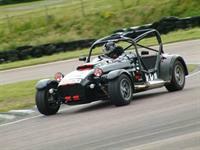 This is a bit of a late update on my first race at Lydden Hill. I have entered two separate race events, one of which is a double header. This gives a format of 2 qualifying sessions of 20 minutes each, and three 15 minute races. That's a lot for a first race day! The cars i'm racing against are a very mixed bag... there's one other megabusa, mostly caterhams, and three radicals. There are car and bike engined vehicles with wildly ranging power - for example, there are several caterham superlights, CSR 260s, and a westfield with 250+ bhp. Not much chance of getting too high on the grid then, as i'm vastly outpowered. On my first qualifying session i achieved 18/20 with a 47.6 seconds time and managed to blow off a silicone water connector, luckily i stopped the engine quickly. The repair took exactly 60 seconds less time than the gap between qualifying, so i was pushed to get back out to qualify for the second race. Despite this, I managed 16/20 and improved lap time by a few tenths to 47.3 seconds. On the first race, it really was sensory overload. I had a bad start and everybody overtook me. I then followed the last place person, with the occasional failed overtake attempt and finished last.... but i finished, and that's what is important for my license upgrade. Second race was pretty much the same deal, but i was starting to drive more aggressively and closer to the car i was following. On reviewing this, i decided this was the way forward and i need to take control!! Third race, i managed to get past the two cars at the back, both in the same place - i dived up the inside on the hairpin and out-dragged them on the following straight. 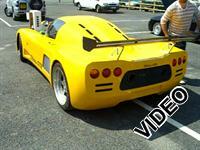 Then I saw the 'LAST LAP' board just as I came up to the car third from last, a bike engined yamaha caterham. Without thinking, i dived down the inside of the hairpin, lost a lot of pace, went neck and neck around the last corner with him having the faster line, and we crossed the finish line one hundredth of a second apart... with me in the lead :) Result!! After the race, i inspected the car and found i had a totally destroyed rear tyre. The car was oversteering out of every single bend, caused by my anti-roll bar being snapped at the front, but still present at the back. This is number one thing to fix. It cost over £11,000 to build this engine, and i got a bargain price of nowhere near that - we agreed a part exchange swap for my old engine. I turned up at Jeff's and 2 other westfield owner's were on hand to help with the swap. Before doing anything we went out for a test drive, and i came back shaking - it is a totally different beast, scary power.... i can't wait. With 2 Cars side by side, 4 guys working on them, it only took 3 hours to take 2 engines out and put my engine back in. Yesterday Chris and I spent the day finishing it, installing the new uprated manifold, cutting huge louvre grills in the body and getting plumbing and electrics finished. See pictures! Its now running, but i'm not driving it until it is mapped properly. It is fuelling for a 1300, so will be very lean. And look what happened to my Audi tyre! A crazy day, more accidents than i have ever seen. In first qualifying i beat my best lap time ever with a 43.9 which put me in 8th. I then finished the first race in 5th... probably mostly due to people crashing. Second race saw me spin off and finish 10th. Third race qualified 12th and finished 8th... but that one included radicals. Overall pretty successful - i was definitely the fastest car on road tyres. The car was stunning at Brands, overtook absolutely everything! July 23 2008 - The slicks are on! The slicks are on the car, lets see how it goes on saturday! Unfortunately a combination of oil starvation and overheating caused my engine to go pop at Rockingham. it's being rebuilt in the states at the moment, and re-bored out to 1598cc from 1548cc. That should give an extra 12bhp or so. See the pics for progress so far on mounting the radiator and oil cooler, took pretty much all day! Tomorrow will be plumbing and making thermoplastic ducts. Just before the engine blew up! August 25 2008 - New Garage! The move to the new garage has been completed, the new luxury carpeted workshop awaits! I reckon i should have a chance to do the small fiddly jobs that got neglected before. I have completed the inner ducting, cut a new hole in the top of the nosecone, half fitted the gauges. Need the engine now! August 28 2008 - Fireplace Ornament? What better use of a knackered £2000 billet crank, arrow conrod and alloy piston? August 31 2008 - Engine in! The new engine is in, and i've been for the first of 8 run-ins. The engine is running with 'running in oil' which is crappy stuff specifically designed to cut the piston rings and bed the cams in. The new engine is certainly powerful and torquey - i wheelspan in 6th gear! New temerature gauges were great, i really feel i can trust them. A 10 minute drive and temps didn't go above 75, but it is pretty cold and i was keeping rpm below 6000. September 10 2008 - For Sale! The megabusa is for sale, i'm accepting serious offers. In the region of £16,000 gets the car with the standard engine, or around £20,000 with the 1595cc. I'm not selling the car any more, i'm rebuilding it, and abandoning Hayabusa power. i guess i need to shut this site down and rename the car... but it's difficult to get similar image and branding for a dull old ford engine!! This is the last post on this website before www.durabang.com takes over. Thanks to everyone for watching progress and keeping an eye!